There are some destinations that just plain surprise you. Having spent 2 days in Phoenix prior to visiting Sedona and becoming accustomed to dry deserts and sprawling cacti, I couldn’t have imagined how much the scenery would change in just a short two-hour drive north from Arizona’s largest city. Sedona is an outdoor lover’s paradise with amazing landscapes as far as the eye can see. In fact, if you love the outdoors, then one day in Sedona would seem like blasphemy. There is so much spectacular countryside that you could easily add a week’s worth of hikes to your Sedona itinerary and not run out of things to do. However, if you are short on time and just want to get a taste for this town then a day trip from Phoenix or Scottsdale can give you the perfect introduction to Sedona and likely result in you yearning for a return visit in no time! If you’re going to tackle a day trip to Sedona from Phoenix or Scottsdale and want to make the most of your time in the city then it’s imperative to get an early start! The Phoenix to Sedona Drive is 2 hours along the I-17 highway and as a lot of the hikes can get quite busy, I recommend trying to leave at the crack of dawn to be able to enjoy some of the scenery to yourself. If you’re thinking of spending more than one day in Sedona, then you can afford to be a bit more leisurely in the morning. You also have the option of taking a detour along the 87 highway which is a far more spectacular drive compared to the main highway. One of the highlights of this drive is stopping at Tonto National Bridge which is believed to be one of the largest natural stone arches in the world. Depending on how jam-packed your Sedona itinerary is, you can either have a quick stop here for a glance at the bridge from one of the lookout points or go on one of the longer hikes in the area. Entry to the state park is $7. Once you arrive in Sedona from Scottsdale or Phoenix, then make sure you waste no time and head straight to a hiking trail! Of course, if you didn’t have enough time to pack a lunch before setting out then it might be worth stopping by Desert Flour Bakery – a local shop that makes delicious sandwiches which you can take with you to enjoy from a viewpoint. 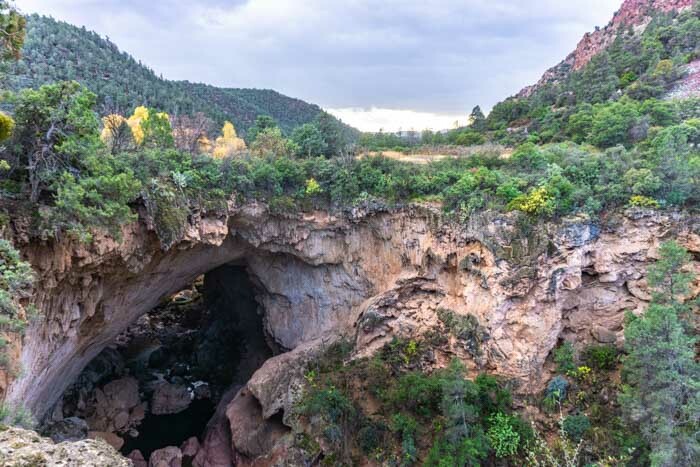 The most popular hike for travellers wanting to experience Sedona in a day is to tackle the Devil’s Bridge Trail. This trail is approximately a 2.1 one way/4.2 mile round trip hike from the car park at the trailhead. The trail is fairly flat for the first two-thirds of the hike before becoming slightly uphill in order to get to the main viewpoint. The hike’s path is well defined and as aside from some loose rocks, shouldn’t cause any problems for people with a moderate level of fitness. As mentioned this trail gets extremely busy during the day so it’s best to tackle it first thing in the morning. The car park at the trailhead does usually get full however there is overflow parking on the main road. There are no entry fees for this hike. If you want to experience an alternative hike during your one day in Sedona then it’s worth considering the West Fork Trail. The trail itself isn’t too difficult as the elevation doesn’t increase much throughout the hike and it is only 7.2 miles long. The difficulty with this trail is that there are 13 creek crossings that you need to contend with! In the summer these crossings are fairly straightforward for the experienced hiker however as the trailhead is at a higher elevation than the town of Sedona, it gets extremely slippery and icy during the winter months. The tall canyon walls and peaceful woods make this trail an absolute delight to walk through but I highly recommend taking trekking poles with you, particularly in the slippery winter months. There is a $10 entrance fee per vehicle for up to 5 people to get to the trailhead. If you didn’t pack a sandwich for your hike, then chances are you will be ravenous by the time you have finished your morning hike and made it back to central Sedona. Luckily, there are plenty of affordable Mexican eateries that provide fantastic value for the calorie-burning hiker! If you have to narrow it down to only one, then you can’t go wrong with visiting Tortas de Fuego which has two locations in Sedona and serves many traditional Mexican dishes along with enough vegetarian options for your non-meat eating friends. Apart from the amazing hiking and scenery, the other thing that makes Sedona famous is the new age and spiritual lifestyle and it’s accompanying shops that make the town and its residents unique. You’ll notice plenty of new age shops as you drive through Sedona offering things like past life readings, healing crystals and other spiritual services. If you aren’t as spiritual as some of the residents in Sedona, then there are still a number of craft and boutique shops that are worth exploring which make great unique gifts for family and friends. I recommend stopping at Tlaquepaque Arts & Crafts Village to find the best of these shops in one handy location. As the name suggests, there are a number of unique art galleries to explore as well as jewellery shops and other artisan stores. We particularly enjoyed our stop at Spirits & Spice which stocks a number of unique spices, oils, spirits and vinegars which you can sample until you find the perfect flavour! Once you’ve got your fill of artisan shops, head over to The Chai Spot which is located in the same complex and serves delicious authentic chai that will transport you to the streets of New Delhi! They also have some coffees and teas as well as an outdoor balcony to enjoy your beverage! There is no better way to end your one day in Sedona than in exactly the same way as you started – back amongst the spectacular nature! The best place to catch the sunset is to head to Airport Mesa Viewpoint. It is a short five-minute walk up from the car park to the main viewpoint where you can enjoy a 360-degree panorama of Sedona! Unlike many other sunset spots around the world, the highlight of this viewpoint is seeing the changing colours of the rocks rather than the actual sun itself! Parking is extremely limited at the viewpoint so it’s best to aim to get there about 30 to 45 minutes before sunset so you can claim your spot. Many cars that couldn’t find a spot would park alongside the road however there are ‘No Parking’ signs so do so at your own risk. Further down the road, there is another sunset viewpoint known as Sedona Airport Outlook. We found that the view here isn’t as good as the Airport Mesa Viewpoint, plus you have to pay $3 to park your car here. There are, however, a much larger number of spots so it’s an alternative choice if you can’t stop at our recommended viewpoint. Whether you’re an outdoor lover or simply have the luxury of enjoying a more leisurely trip then there are plenty of options for travellers spending 2 days in Sedona or more! There are so many hikes to choose from in Sedona that you will have no problem filling in any number of additional days on your Sedona itinerary! A great place to start if you’re unsure which hiking trail to choose from is the All Trails website. They have detailed descriptions of hundreds of hikes in Sedona as well as offering advice on the level of difficulty and allowing recent hikers to leave their own feedback on the trail. If you want to explore more of your spiritual side while in Sedona, then hiking to Cathedral Rock or Bell Rock offers you the chance to see more of Sedona’s famous vortexes. These spots are known as being some of the most spiritual in all of Sedona and don’t be surprised to see people meditating or doing yoga at these locations. Even if you don’t have a spiritual bone in your body, then these hikes are still spectacular to enjoy! If your muscles don’t recover quick enough to allow you to go hiking on back to back days then why not consider an alternative mode of transport? Jeep tours in Sedona offer travellers an opportunity to sit back and go off-roading through the amazing scenery and see a number of the fantastic viewpoints in a few hours. You will also be able to learn more about the local history and geological makeup from your guide. If you have 3 days in Sedona to spend, there are a number of great day trips from Sedona that are a great addition to your itinerary! The most famous and arguably spectacular option is to take a day trip to the Grand Canyon. The Sedona to Grand Canyon Drive will take approximately 2 hours each way and allow you to have plenty of time for a short walk along the rim, lunch at one of the lodges and then take in some of the beautiful viewpoints before heading back to Sedona in the evening. You also have the option of stopping in the college town of Flagstaff for dinner or even to spend the night if you don’t feel like driving all the way back to Sedona! Alternatively, there are plenty of other state parks that are well worth a visit such as Slide Rock National Park where you can enjoy their famous natural water slide or Tonto National Bridge on the way back to Phoenix. Either of these options makes for a great way to end 3 perfect days in Sedona! Airbnb – There are a number of private rooms available to rent in Sedona if you’re travelling on a budget. A great way to save even more money is to stay a bit outside of Sedona such as in Lake Montezuma where rooms are even cheaper! Click here to get up to $40 off your first stay. Spending 1 day in Sedona is a fantastic option if you’re looking for a day trip from Phoenix or Scottsdale and gives travellers the perfect introduction to this amazing town. However, there are also plenty of things to do if you choose to spend an extra couple of days in Sedona! Are you planning on spending one day in Sedona? Or have you recently visited? Let us know in the comments below!